"Why do most Episcopal churches have red doors?" This question often gets asked by folks who have recently joined their local Episcopal parish. Cradle Episcopalians never ask this question because, well, the doors have always been red so don't question it. My current parish, St. John's in Hingham, Massachusetts, doesn't have red doors. No one ever thought to paint over the imposingly beautiful antique oak doors which were recently refinished. Plus, when you live in the place where Talbots was founded you quickly realize there's only room in this town for one set of red doors. During my seven-year tenure as rector at All Saints' in Briarcliff Manor, New York, we had the red doors repainted. This led to the question of what shade of red. Oddly enough Benjamin Moore doesn't carry "Episcopal Red." But after extensive research, including a conversation with the property support manager at the diocese, we found our red (I can't share the name with you because it's a state secret. And I forgot the name). The guy from the diocese actually wasn't helpful in determining the correct color but he did do some research for us about why the doors are so often red in the first place. Thinking about red doors made me wonder about the origin of this practice. In fact, he contacted the curator of the medieval department at the Metropolitan Museum of Art. We learned that red doors are pretty much unheard of in England so we didn’t inherit this out of the Church’s Anglican heritage. And we also learned that the practice is not peculiar to the Episcopal Church. It seems to have started in some other churches in the United States and crept across denominational lines. Many see the red doors as symbolic of the shedding of Christ’s blood so that all who come to him through the church will be saved. And in earlier times red doors were symbols of refuge and sanctuary for all who entered. It was understood that a soldier could not pursue an enemy that had passed through the red doors of a church. So over time the red doors came to symbolize not just physical safety but spiritual refuge as well. There’s also some anecdotal evidence that churches painted their front doors red when the mortgage was paid off. Which beats another theory I heard recently that evangelicals who thought the Episcopal Church needed the Holy Spirit would go around splashing red paint on the doors. Hmmm. The truth probably resides somewhere within the various theories. But regardless, I like to think the doors are red because the Holy Spirit dwells within. Not just inside our doors but within our hearts and minds and souls. Only then can a church truly be a place where Christ is encountered and boldly proclaimed by all who enter its doors. Love your picture of the red door! 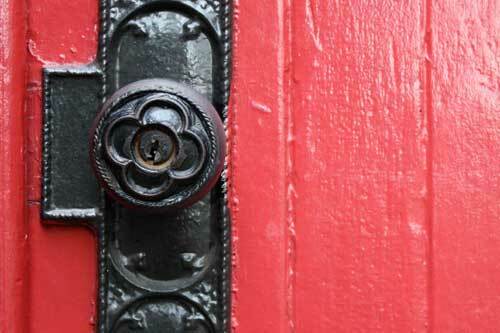 As it so happens, our diocese's 186th Annual Council's logo is going to feature a red door. This came about because four of the host churches have red doors. Would you be willing to let us use your picture for our website? I don't want to pick one from the host churches (and thereby show favoritism). Also, your picture is perfectly framed! Hi Suzanne. I don't own that image -- I think I found it somewhere, so I'd just go ahead and use it. It was public domain. Good luck with the project! Thank you for the quick response! I appreciate it! We may not end up using it permanently, but until they make a decision on the logo I am thrilled to use it.